Building energy costs can be a significant part of any large organization’s budget and its carbon emissions. Still, tracking monthly utility bills over time is a nit-picky task. 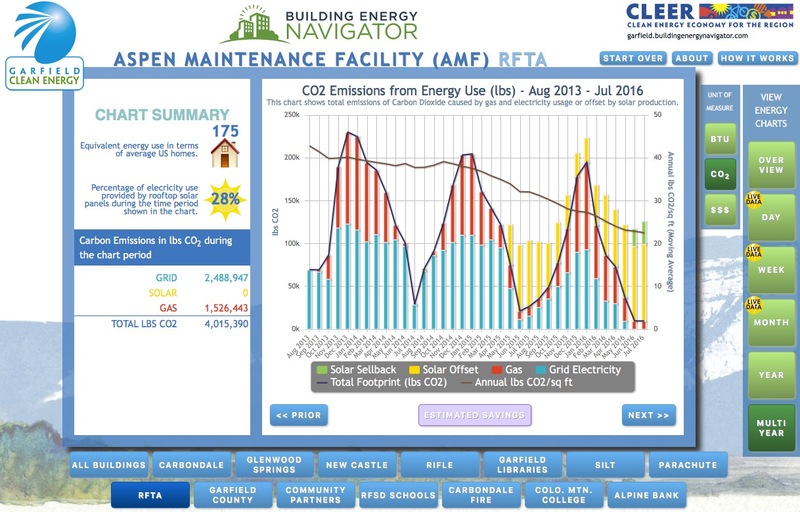 CLEER’s Building Energy Navigator simplifies the job, providing easy access to dynamic charts that display energy use, energy costs and carbon emissions for one or more buildings. Watch a 19-minute demo to see the functions and flexibility of CLEER’s Building Energy Navigator. The Building Energy Navigator website imports energy bill data and displays it in month, year and multi-year time frames. On-screen buttons zoom in or out on the time scale, and display energy use by BTUs, dollars or carbon emissions. For large buildings and facilities, on-site data-loggers relay energy use to the Navigator system in 15-minute intervals. Facility managers can log in the next morning to see weather and occupancy variables, and measure the effects of operational adjustments. CLEER’s team of experts can help your organization with on-site technical assistance. Deploy the power of data and maximize energy savings by using Building Energy Navigator. Track solar energy production, on-site electric use and net solar offset. Track the week’s energy use in 15-minute increments, and compare to prior years. Track year-over-year monthly energy use, spending and carbon emissions. 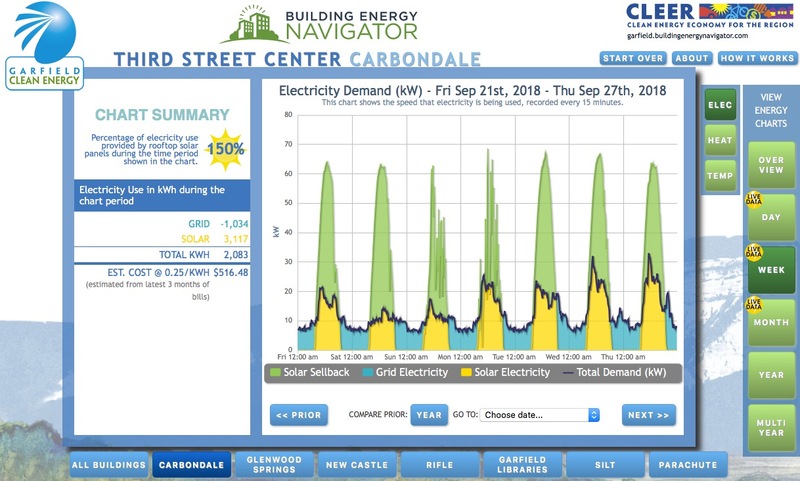 Buildings or facilities powered by solar arrays can use the Building Energy Navigator to track renewable energy production and compare it to grid electricity consumption. Toggle buttons at far right reset the chart for day, week, month or year views, with year-over-year comparison options. This view shows the Third Street Center in Carbondale for the week of Sept. 21 – 27, 2018. The Center’s 105 kilowatt array offsets 100 percent of the building’s energy use on an annual basis. Navigator’s live data service puts hourly, daily and weekly energy data directly into the hands of facility managers using dynamic chart options. It uncovers energy use problems early on, and reports how buildings react to operational changes, weather and occupancy. This view shows the Quigley Library on the Colorado Mountain College Spring Valley Campus, near Glenwood Springs. Grid electric use during the week of Oct. 11 – 18, 2018, appears in solid turquoise, while grid electric use from the same comparable week in 2017 appears in dotted dark blue lines. Projects at this building between the two comparative weeks yielded an impressive 55 percent reduction in grid electricity consumption and costs savings, shown in the quick-glance chart summary at left. Navigator can display monthly grid electric (turquoise bars) and natural gas (red bars) energy use for a building over a three-year period. The “prior” and “next” buttons compare time periods over longer spans of time. Toggle buttons at right quickly compare energy consumption in BTUs, carbon emissions (CO2), and energy spending ($$$) for the selected time period. This view shows the Roaring Fork Transportation Authority’s Aspen Maintenance Facility from August 2013 through July 2016. The solar production starting in May 2015 is from a community solar array, providing power for the facility but located miles away. 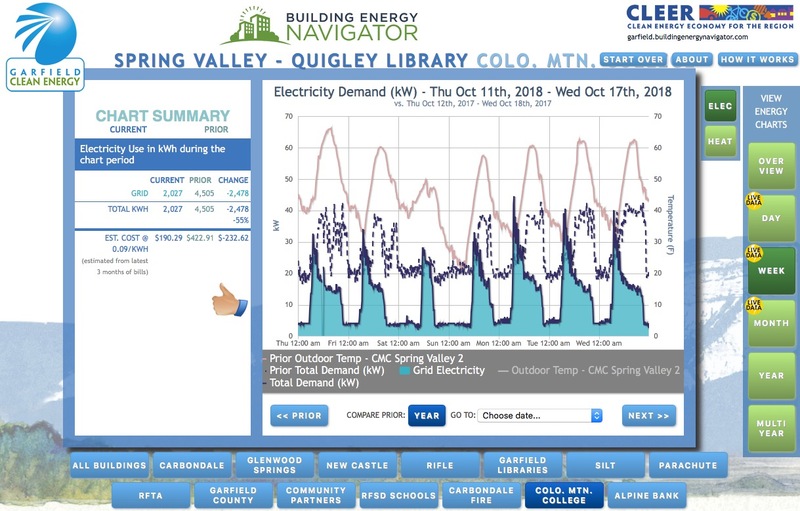 CLEER developed the Building Energy Navigator in 2010 to provide an affordable portal to building energy use and solar production data for the local government partners in Garfield Clean Energy. Today, 100 buildings across Garfield County and more than 50 buildings elsewhere in western Colorado use Navigator to monitor energy usage and spending. This homegrown website is a powerful tool for building managers to track energy use in large buildings and in big energy-using facilities such as water treatment plants. Good energy performance means more than just buying energy-efficient equipment, it means being active in managing your energy use. A complete description of CLEER’s Building Energy Navigator, including installation and pricing options, is available on request.